Goldfinch Bros., Inc. recently finished installing Schuco windows and sunshades for the Seattle Academy of Arts and Sciences (SAAS) building. 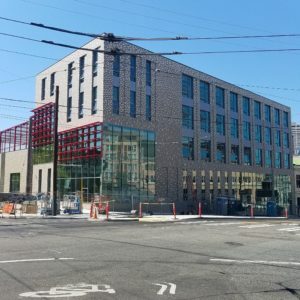 The structure, designed by LMN Architects, is being built in the Capitol Hill neighborhood and will provide spatial and flexible contemporary classrooms across its 74,290 square foot floor plan. According to Estimator and Project Manager, Jenae Goldfinch, GBI installed 5 different shades of red sunshades on the SAAS building. GBI also worked on the SAAS STREAM building, which was designed to exceed LEED Gold standards. STREAM opened to students and faculty in September 2015.